Arriving in Ramallah on Wednesday afternoon, Prince William met with Palestinian Authority (PA) Chairman Mahmoud Abbas. 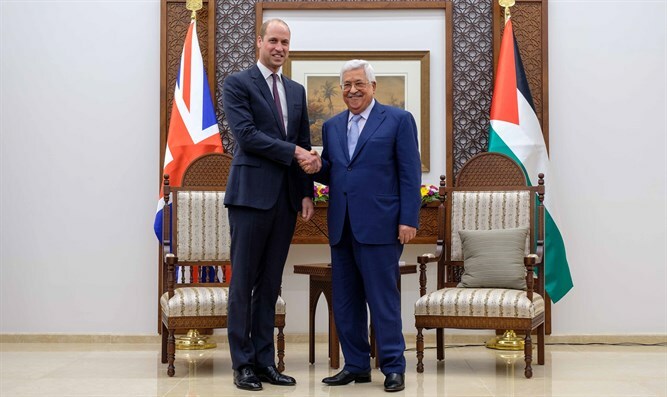 Prince William was received in Ramallah's Mukataa, and afterwards had a private conversation with Abbas. During their discussion, Abbas told Prince William that the PA is interested in reaching an agreement with Israel, "so that both states can enjoy security and stability within the pre-1967 borders." "We want to reach peace through negotiations, and our stance has not changed in a long time," Abbas claimed. Abbas also expressed hope that Prince William will visit "Palestine" when it becomes a state. "We are committed to fighting terror everywhere, so we find ourselves in contact with every country in the world regarding this issue," he claimed. In August 2017, Abbas admitted that he still pays terrorists' salaries, and promised to continue paying them until his "dying day." Abbas reiterated that stance in October. A full 10% of the PA's budget goes to paying terrorists and their families, with the amount a terrorist or his family receives dependent on the severity of the attack, including how many Jews were murdered.